Lighting outside the home is just as important as lighting inside the home. 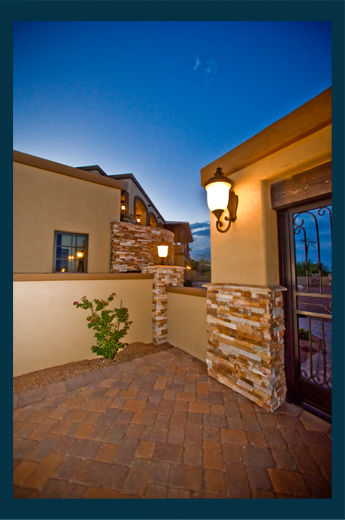 Outdoor lighting enhances the beauty of your yard, increases safety and improves the time spent outside. In addition to outdoor lighting attached to the home itself, landscape lighting can add another layer of drama and security to your home. How does a dark sky ordinance affect my lighting? If you live in a city with dark sky ordinances, make sure you're aware of the fixtures you're looking for. Dark sky fixtures are designed to only point down to not obstruct the night sky. If you want to light a patio, a dark sky fixture is not for you. What size lantern is appropriate around a door? The size of a lantern depends on the number of lanterns being used. If one lantern is being used, it should measure approximately one-third the height of the door. If two lanterns are being used, they should measure approximately one-fourth of the door. Also, the center of the light bulb should be approximately 66" above the bottom of the door.